The Matobo Hills are a living cultural landscape in south-western Zimbabwe, where people have interacted for over 100.000 years with the distinctive local rock formations. The very specific ecology of this area (moist and rocky) leads to a wide range of flora and fauna (notably black eagles and leopards). The rocks also provide natural shelters for humans: there has been occupation from the early Stone Age on and intermittently since, proved by archeological findings. 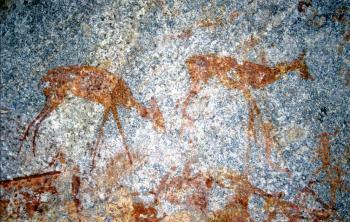 The hills are home to an outstanding collection of rock paintings, the largest in southern Africa. There are round 700 known sites with some 20.000 paintings. They date from the late Stone Age and the Iron Age, the eldest from 13.000 years ago. The themes depicted are associated with hunting and gathering. The places still is part of a living tradition, via shrines and sacred places connected with the high God of the oracular cult Mwali. 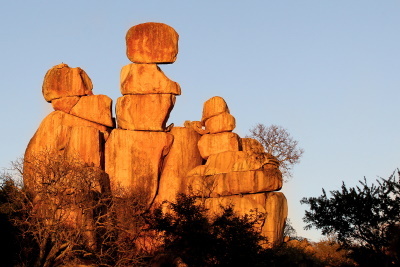 Compared to Tsodilo (Botswana), the Matobo Hills are older and a from a different cultural tradition. There is also high-level similarity to other sites in the region (Namibia, South Africa). c. At “World’s View” outcrop the “White Colonial” memorials of Rhodes Grave and the Shangani Patrol (in memory of a group of white soldiers wiped out by the Ndebele in 1893). e. A number of caves or overhangs which can be visited and contain Rock paintings whose age is still a matter of some conjecture but were done by Stone and/or Iron age hunter gatherers. Somehow all these aspects (including the Colonial memorials!) are credited in the inscription. Given time to explore and/or access to appropriate wildlife expertise the area would no doubt repay more in-depth exploration than is possible during a quick “tourist visit”. Certainly a trip to Zimbabwe without visiting the area at all would be seriously incomplete. We gave it a full morning (we had our own vehicle) and nothing I have read since makes me regret not giving it more. But what image should be used to capture the essence of the park? Looking back I think the paintings were the highlight (photo). These are no primitive “stick creatures” – these representations could almost walk off the wall so lifelike is the result of a few deft lines and simple colours. Tombs: "Graves of King Mzilikazi who formed the Ndebele nation and Cecil Rhodes who led European settlers into the country are both within the nominated area."